The new AWPR around Aberdeen cuts across the North Deeside Road at the entrance to Peterculter on the edge of Aberdeen, resulting in a new junction being built to accommodate the access road to the new bypass. For several months this junction has been working well with a temporary roundabout, but recently temporary traffic lights have been installed instead as new permanent traffic lights are put in place. This has resulted in unacceptable levels of delays, particularly at rush hour, with school buses being late, appointments being missed and some families ending up taking two vehicles to work so that they can stagger their drop off and pick up times from nursery. While we realise the current situation is temporary, it is believed that it is indicative of what will happen when the final junction is operational with traffic lights and local opinion is that this would be better served by a new permanent roundabout. Consequently, and in response to demand from the community, Culter Community Council has arranged a public meeting to be held in Peterculter Parish Church on Tuesday 5th December from 7pm – 8.30 pm. 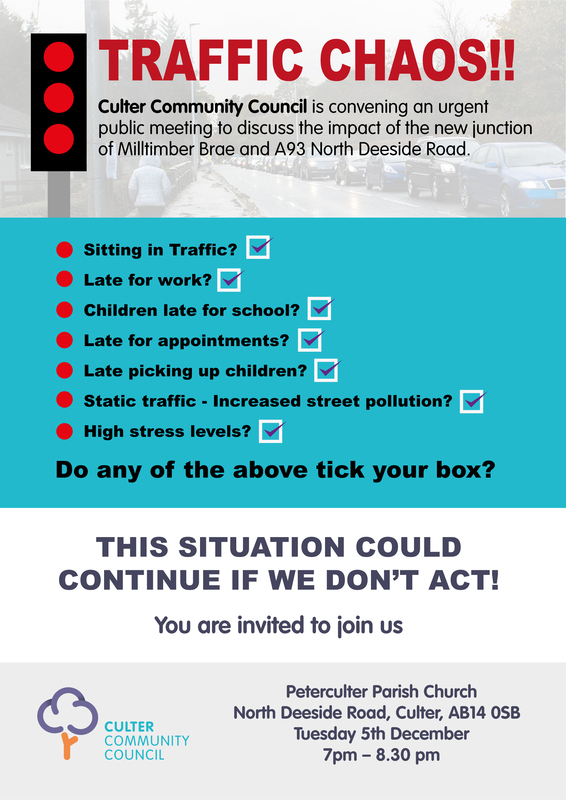 Representatives from AWPR and Transport Scotland have committed to attend this meeting to answer our queries and a large turnout from the community will help to make our point. Attached is a flyer which has been delivered to every house in Culter which contains more information.